Japan’s hopes for a thriving private spaceflight industry have been dashed once again. 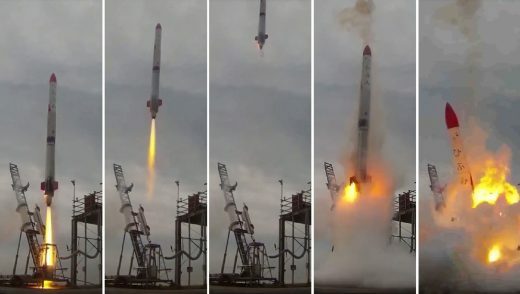 Interstellar Technologies’ second attempt at a rocket launch has ended in spectacular fashion, with its 33-foot MOMO-2 vehicle crashing (and bursting into flames) just moments after liftoff. The company put on a brave face with word that the launch facility remained intact and a promise that it would continue the program, but it’s hard to be optimistic when the 2017 launch at least cleared the launchpad area. It’s not certain how this will affect plans to put a satellite into low Earth orbit by 2020. Interstellar has yet to indicate what might have caused the crash (besides a sudden lack of thrust, that is). However, this doesn’t speak well of the company’s strategy so far, which has relied on using existing parts where possible instead of designing everything from scratch. It promises to dramatically reduce the cost of flights (the original MOMO cost $440,000 versus the government’s $1.8 million or more), but that only holds true if it works. It also doesn’t help the reputation of Interstellar founder Takafumi Horie, who rose to prominence as the creator of internet service provider Livedoor but has earned a reputation as a rogue entrepreneur and spent two years in prison for accounting fraud. It’s hard to shake comparisons between him and other space-minded luminaries like Elon Musk and Jeff Bezos, both of whom have made considerably more progress (albeit not without failures). Horie may not be as ambitious, but there’s more pressure than ever for him to show that he can compete and give Japan an option beyond the government’s space program.